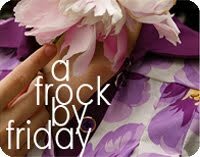 Grosgrain: Social Darling Frock GROSGRAIN GIVEAWAY!!!! CLOSED. 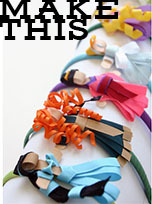 Social Darling Frock GROSGRAIN GIVEAWAY!!!! CLOSED. I've been sifting through your survey answers. They've been very enlightening to say the least. I'll be doing another post about it later but for now I wanted to address one of the larger issues which you may already notice has hopefully been corrected. I've enlarged my fonts. I had my lovely sister model this next frock. Perfect for holidays especially New Year's. 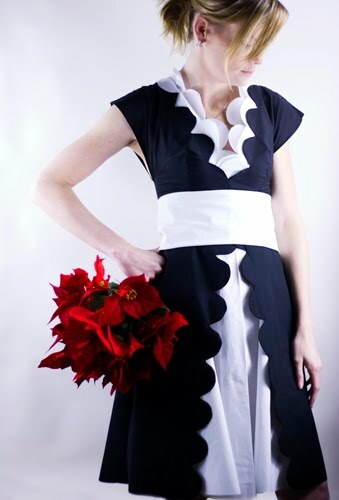 I originally got the idea for this dress from a suit case I saw with a white scalloped edge. I thought it would really interesting on a dress. The scallops are echoed in the skirt as well as along the neckline. The black scallops are framed with the feathered layers of white scallops. This nicely covers the cleavage. I know I always like that aspect. The layered white scallops also stretch up at the sides of the neck for a sophisticated look. The top black skirt opens in the front and overlaps a white underskirt. The dress is cinched at the waist by a wide 5" white sash. The sash then crosses in the back and peaks out at the sides for a feminine look. The sleeves are capped and have no seam between the bodice. I was lucky enough to get my sister to make time in her busy day to stop by at my house and take these photos. Although she did comment on how my basement studio setup looked like a crime scene out of CSI. Did I mention how dank it is? Really, you'd never believe what it looks like around these photos. You may recognize Chan from my Limoncello Frock. I use the word 'may' because I photoshopped her hair a dark brunette in those photos. This is what she looks like in real life and honestly, I have to say, blond is better....on her. I really liked the way the dress flattered her waist. Of course, with a body frame like hers it's not that difficult but I think this a-line skirt would flatter most figures. I imagined wearing this dress to a holiday party and getting many compliments;) Chan even told me that it was something she would wear and I don't doubt she'd tell me if she didn't like it. This dress would fit a size 2-5. NOTE: Blogger is fixing an error with the 'Create a Link' Link. This applies to all 'Create a Links' on all pages. You might get an error code: bX-w3yevs. If you do, check your page to see if it posted anyway. If it hasn't and you want to create a link just do so by posting it to your blog the way you would normally make a post. (ie, the old fashioned way). I will let you know here when this problem is fixed. I am absolutely in love with this! So, of course I wrote about it on my blog and linked back and will be crossing my fingers forever. Here is a link to my post! That is a beautiful dress. I'm way too old for it, but it will be lovely on a younger person. Nice sewing! You have such unusual and terrific ideas. Wow! I love it! You inspire me. I've started sewing because of your inspiration. I really enjoy reading your blog! Thanks for sharing your wonderful talent! I am having so much fun discovering the creativity within myself, and I'm not sure I would have been so inspired if it weren't for you. Thank you! Very cute...linkied to you! Red earings would look amazing with the dress!! I SO need to win this dress! Absolutely loving it! Wow. What a great dress!!! That is so beautiful! You are so creative! One of these days, I'll win a dress. You should open an etsy shop. Maybe you have one and i just can't find it. This is such a great dress! If I wasn't bigger than a size 5 I would totally shoot for this dress. But no dice, I'm a 10-12. So feminine and modest at the same time. So hard to find that in a dress anymore. I would love a pattern for this one! I LOVE this one!!! Great work! This is absolutely adorable. I need it. Hi! I just discovered your blog through the Tessuti blog. I'm a self taught seamstress too and your posts are great. So lovely. I posed about it on my blog - check it out! Love the dress! It's so simple, yet so elegant, yet so beautiful! THis is absolutely lovely! So dramatic and feminine! Oh my gosh!! Very simple yet darling! I love it sign me up! I love this dress...I linked to it! heidi-grace.blogspot.com I would love to win it! :) And your sister is very pretty! I've been enjoying all your lovely dress creations for some time now. This is another of my favs :) I'd like to request a post about sewing maternity wear. I loved your Hop, Skip and a Jump Maternity frock and am working on some maternity clothes for my sister who's expecting in the Spring. Do you have any hints for altering patterns to fit the pg belly? Or tips on line/drape/rusching and tailoring for the pregnant shape? Count me in! count me in! This is my most favorite Grosgrain "for adults" thus far...beautiful! I'm so hoping to win!!! Amazing original dress! I created a link! I really think you should be on project runway. you have such a sophisticated and chic design sense. This dress is a dream. and so are you ;) and your sewing hands. hats off as usual. Hi--your designs and dresses are quite lovely, as is this one. But could you please consider making a least one dress bigger than a size 2-5? I posted a link, thanks for making such awesome dresses all in my size! I posted a link! I'm so glad your dresses are in my size! I'm having Blogger issues. . so please excuse the double link! VERY cute! Love all your designs. I just found your site and love it! Also , I posted about you giveaway...I am an 8...sometimes smaller...any hope for this dress? this is a fabulous scalloped edge dress! i love it! it's adorable! It really is a special dress. I love your talent. I posted a link on my newly resuscitated blog. Hope to win! And if I don't fit the dress (tummy probleme here) I do have a very fit little sister who will ! This dress is lovely. Seriously, just lovely. posted on my blog. Here's to hoping. Oo so pretty. Oh I hope I win! Oh how lovely! I would love to win this! You are such an amazing seamstress! Very talented. Very beautiful work! damn I wish I had a waist! I wish I had your ability to make amazing dresses! I posted a link! do you make patterns for your clothes, because i would buy them! BTW @Kelly, I am sure you would look fantastic in the dress if you win it! Oh, I LOVE this dress. It has such a great design. If I will you can bet you'll see it on me for New Years. Ablsolutly lovely work. I've posted a link on my blog. Thank you for sharing. I created a blog just so I could win this gorgeous dress! I posted a link as my first entry. ur dress is so unique!!! beautiful!!! Love this fun little party dress. the scalloped edges are to die for! love the dress!!! even if I dont make it, is there anyway I can buy it?!?!?! please please please make it available for sale!!!! I've posted the last three give-aways on my blog, it's been fun to see all these new and creative accessories! posted a link in ny livejournal.. This dress is so adorable... I love black and white!!! simply chic and a classic. Love it. Holy shmouly... this dress is absolutely stunning... would love it!!! I must own this. Please, please, PLEASE!!! Your dresses are just gorgeous! I love it! I don't think I could ever make something as beautiful! You inspire me~! Beautiful... wouldn't fit me, but I have a lovely size 2 sister who it would fit! The the scallops. Makes me think of pearls. I don't know if a tweet counts for the giveaway, but I linked! This is really adorable! I really just adore this dress! I could only dream of winning this dress! It is so beautiful and very classy! I could actually wear this dress now. I started running back in May and now am running 3 miles a day so my body has gone through a huge transformation. I am a mommy to 5 kids and all the money is spent on them and their clothes. How cute would I be going to church or on a date with my hubby in this dress! seriously love this dress! it would make my day to win! I just love this dress! You are so talented! I mostlt sew for my girlies. I am not a blogger, however :( Being a day-caring, home schooling Mom of 4 does really allow much time for myself, LOL! I LOVE this Dress!! So beautiful!! And the details are perfect!! This dress is beautiful!!! Here is a link to my blog! Found your giveaway and I was totally blown away! It's amazing! Don't know how it would fare in the snow we have here in Norway around Christmas, but I would risk a cold just to wear this at New Years Eve! Super Duper adorable (both your sister and the dress :) Thanks so much for the giveaway! I linked! Oh my gosh! This one is Awesome! I'm crazy about it!! did a huge post on unDeniably Domestic! Love it! I've been following your blog for about a year now. I adore your work, specially this lovely dress...you are a genius! This is super cute! Thank you for giving us a chance to win it! This is so adorable!! So my style too! I am so happy I found your site and that is a big thanks to Maura from Fostering Awareness! Anywho, I would love love to wear this dress! I have so many family parties between now and new years day! Also one for my moms club and they would all love this dress and be so jealous!! This month I could never afford to by myself something this nice and it would be a merry xmas to me!! Love your site!! I want it I want it I want it! I sound like a selfish kid at Christmas time. 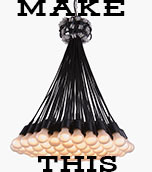 I could never make this, so I need to win it. This is so lovely!!! I really and truly feel that I must win this frock. Because today is a good day. And everyone needs a good day sometimes. Check out where I blogged about it! I LOVE this dress! You are a genius. It's so beautiful. This is a beautiful dress! I would love to wear this to my next Christmas Party!!! AMAZING DRESS! If i don't win, would you make one for me? Here is the link to my blog about your amazing dress! that dress is absolutely adorable? is there anyway to get it now? i am willing to pay for sure, and would need it a bit bigger. wow. what a precious dress. I saw it on Joy @SAHmissionary's blog. Does that count as another entry for her? I couldn't wear the dress - too little space around my waist for a wide waist. I'm short. But a friend who is a designer made a similar one for my engagement party - white velvet with purple underneath. It was beautiful - just no sash. That's a nice dress, too... black and white, yet soft design. I absolutely love those and would love to have a chance to win!!! Thanks for another beautiful dress! i must have that dress! :) ii is simply perfect, and i have the perfect party in mind for it. Love the dress. My fingers are crossed. i'm a curvy woman and think this dress is too delicious for words... it has that a line skirt and the design on the front would draw away from my mother birthing hips- as im 25 the hips dont need to be the main attraction! i love love love your work! and i love this dress! im also infatuated with the yellow one an white one on give away! if only these links would work to post on my blog!! LOVE IT!!! Created a link. What a gorgeous dress. Congrats again for winning the Shabby Apple contest! I want it! When is the giveaway? This is so pretty. Thanks for a chance to win. I recently had my third (and last) child and have finally gotten my figure back after 10 years of packing on the extra lbs. I would love to win this dress to celebrate! I love this dress!! It's very unique :) Here's my link. Whoever wins is a lucky gal! WOW! I cannot believe you're just giving it away! That is soo wondrous! It's something I don't think I could ever make ;A; however much I wish I could. 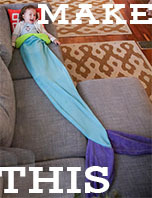 very beautiful...were the scallops hard, Id like to see this in a tween size, it would be adorable! Oh wow! I love this! The black and white is epic! And the scalloped edges are so unique and quirky! Please enter me! Just linked you to my blog. Absolutely beautiful! What a beautiful dress! I'm in love with it. I've got my fingers and toes crossed. WOW! Your dress is fabo! I would definitely buy this dress if you were selling it! I am getting married and it would be the most perfect rehearsal dinner dress! I hope you pick me!!! I am in love with this! SOOOO beautiful! I want it. hi! is this an original design or can i find the pattern somewhere? Is there a pattern I can buy for this dress in a size 16-18??? I would love to make it for myself. Thanks.